Windmill software reads data from instruments and devices connected to your PC. OpenOffice and LibreOffice are both open-source office suites and therefore free! From now on we'll just refer to OpenOffice, but unless stated the comments refer to both programs' Calc spreadsheets. You can collect data with the Windmill Logger application, and after collection has finished import it into your OpenOffice spreadsheet. Alternatively you can transfer data as it arrives, using dynamic data exchange. To do this use the Windmill DDE Panel as a gateway to transfer data values between your instruments and OpenOffice. In the File name box type *.wl and click the Open button. Your saved Logger data files are shown. Select one and click Open. You will see the Text Import dialogue. Select Tab and Comma and click OK. The logged file is shown with the data lined up in the appropriate columns. 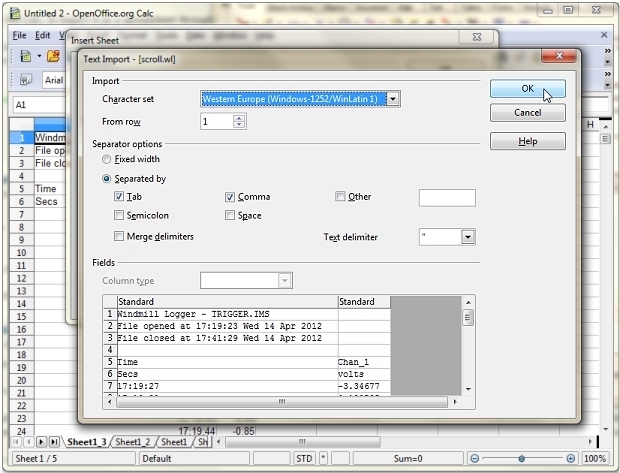 The Windmill DDE Panel lets you copy and paste live data into OpenOffice. Just press the Copy to Clipboard button and choose the type of information you want to copy: data values, channel names, data units, alarm settings, etc. Move to OpenOffice, select Paste Special from the Edit menu and choose to paste as a link. The data in OpenOffice will continually update. then press the Ctrl+Shift+Enter keys to tell Calc that it is an array formula. For more sophisticated tasks, you can use macros. Load Windmill DDE Panel and start collecting data from your instrument. To read data from one channel connected to the Windmill DDE Panel and place it into a cell in the spreadsheet, create the following code.
' Requests data from a channel called 00000. Format the first column to show Time (Format menu > Cells > Time). Create an OpenOffice macro and copy the example macro below into it. Change the channel name (in our example 00001) to match yours. 'of sets of samples requested, the macro will stop. 'If NoOfRows = 3, the first reading will be placed in row 4. 'If DataCol = 1, the readings will be placed in column B. 'Ask for number of sets of samples and sample interval (ms). 'Selects first sheet in workbook. 'so next set of samples is inserted in the next row down. Question on using OpenOffice with Windmill Software?